But check out this wall. 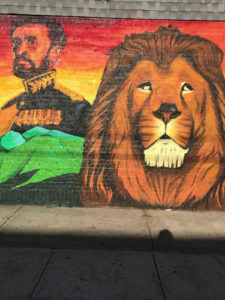 A new mural depicting emperor Haile Selassie currently adorns a Queens corner in Laurelton. The artwork titled “Selassie Mountain” is painted along the wall of the Health Conscious Natural Market at 231st Street and Merrick Boulevard. It shows the former Ethiopian ruler and highly regarded figure in Rastafarianism, alongside the Lion of Judah with a mountain in the backdrop. The owner of the store, who also commissioned the artwork, said the sketch stands to be a reminder of a black king. “We only have one wall and we want to use it the best way that we can, and we just wanted people in the community to know about this black king, who was the king of Ethiopia,” said Larry Love, who is of Jamaican descent. He says many of today’s youth are not being reminded enough about the important pioneers, and figures of African descent across the globe who held these very esteemed and high positions. Love emphasized the need for such artwork as a refresher on history, and as a self-reflective vision, and says the 50 foot wide and 12 foot tall mural symbolizes that. “It represents the black community and with so many wrong things happening in general, this is something positive that’s important and a lot of youth everywhere can see themselves in this,” said Love. The artist behind the work is Vince Valentine, who often paints murals in different parts of the city and around the country. Love said after viewing one of Valentine’s works at another business in Queens, he had to track him down for the project. It took Valentine four days to complete the art project, according to Love, and he is highly satisfied with its final result. He says utilizing the wall of his business gives him an opportunity to offer his neighbors a mural that they can be proud of. “Before we just had our logo, but there comes a time to show what can we do and that’s using the work of art,” said Love. Love says to ensure the work is seen and well-received, next week he is installing flood lights to shine on the mural after sunset, so passerby can view it at all times. 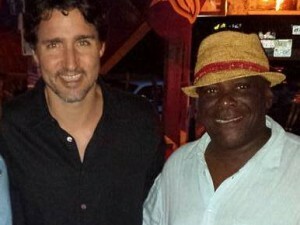 He also plans to use the wall space to showcase a different black figure every year, and by next November he says Marcus Garvey will grace the wall. Health Conscious Natural Market [231-22 Merrick Blvd. between 231st Street and Francis Lewis Boulevard in Laurelton, (718) 712-7740, www.healthconsciousonline.com]. Hours, Sun-Sat., 9:30 am–7 pm.